Rinse bulgar in a bowl and poor off excess water, let sit for 10 minutes. 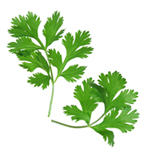 Rinse and finely chop parsley and fresh mint leaves and place in a bowl. Add chopped tomato, green onion, yellow onion, and soaked bulgar and combine with parsley. In a separate small bowl combine salt, dry mint, lemon juice, olive oil and cayenne pepper then add to parsley mixture and let sit for 5 minutes before serving to allow bulgar to absorb some of the dressing. Serve with chicken or meat or by it’s self. Also, can be served in individual leaves of lettuce as an appetizer.